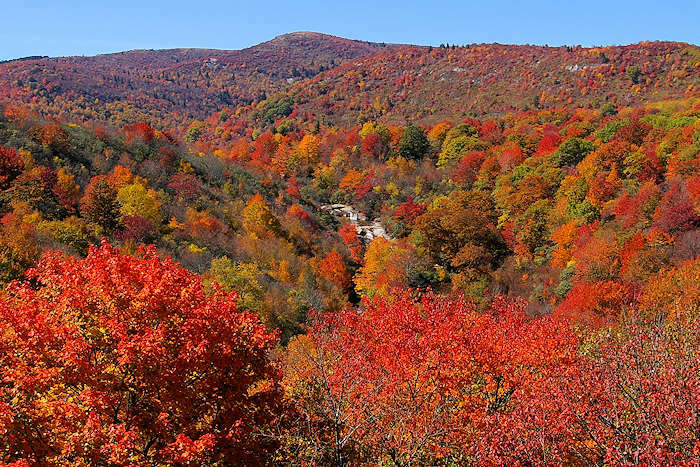 To help plan your October vacation this year, here's our fall foliage photo tour from the North Carolina mountains. For more about the progression of the color show and a complete guide for where to see the best color, see our Fall Color Forecast & Guide. Each location below has a full page guide with more info - just click the links below each picture for more info! 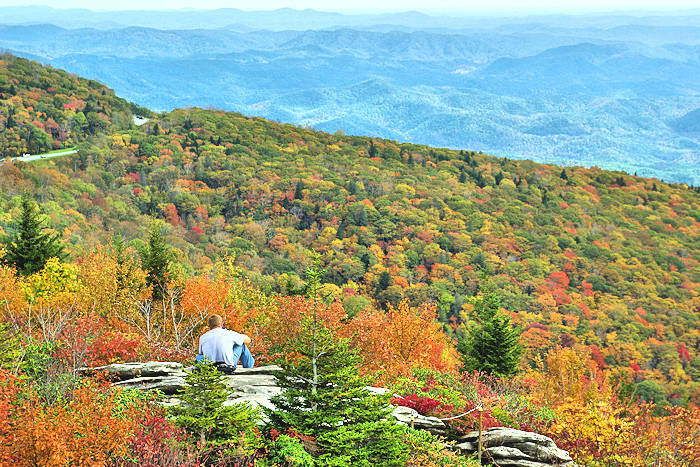 Late September & Early October: First colors usually appear along the Tanawha Trail on Rough Ridge. 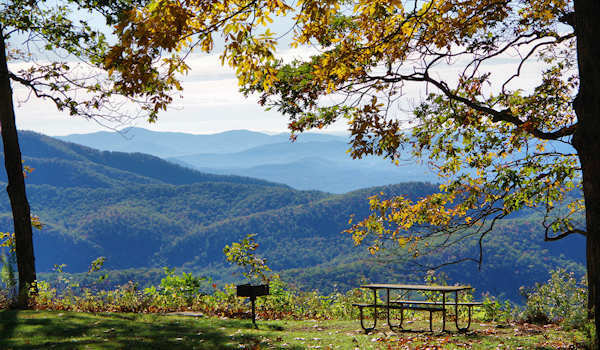 Also see our Fall Photo Tour of the Parkway. 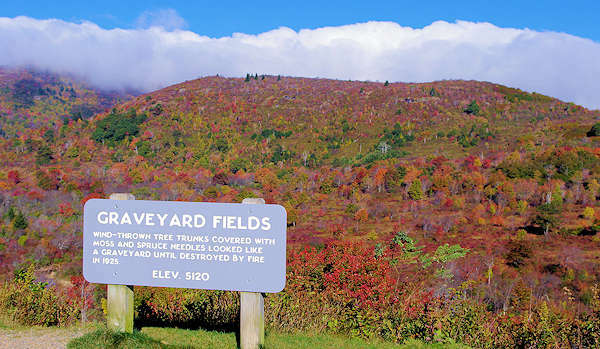 Early October: Graveyard Fields along the Blue Ridge Parkway turns earlier than other nearby places. Find great hiking to waterfalls in this mile-high meadow. Early October: The spectacular view from atop Mt. Mitchell's observation deck with colors starting to pop below. 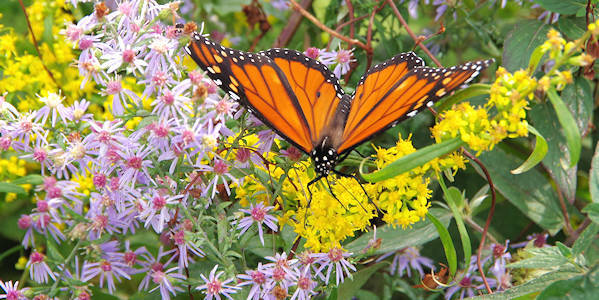 Early October: The amazing Monarch Butterflies flock to the wildflowers on the Parkway as they migrate to Mexico. Read about them! 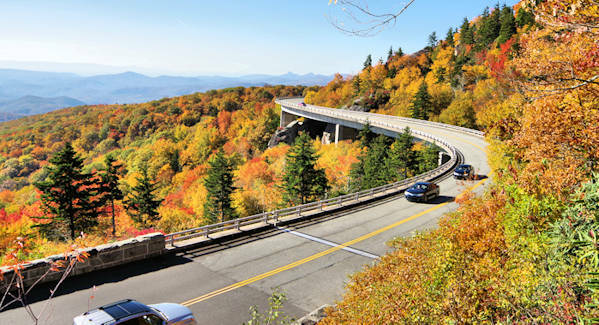 Mid October: The Linn Cove Viaduct on the Blue Ridge Parkway. 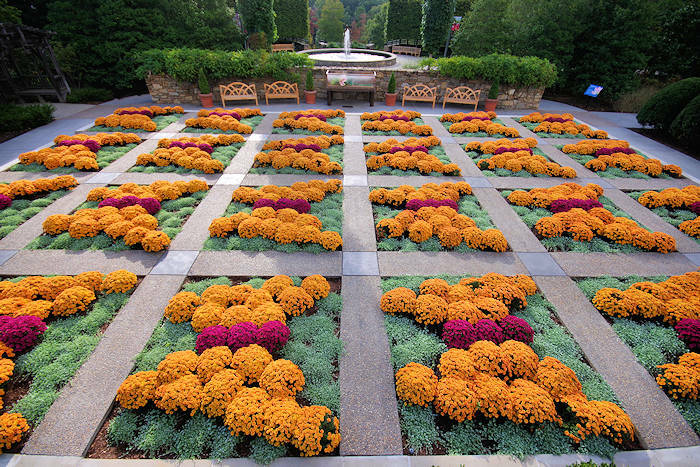 Also see our Top 20 Fall Spots on the Parkway. Look down as you hike! 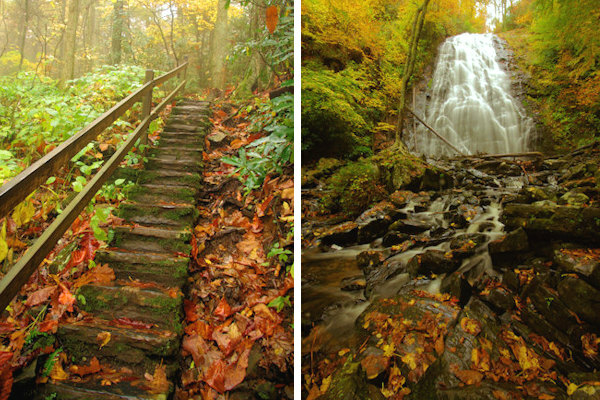 Nature's beauty along one of our Top 60 Hikes near Asheville. 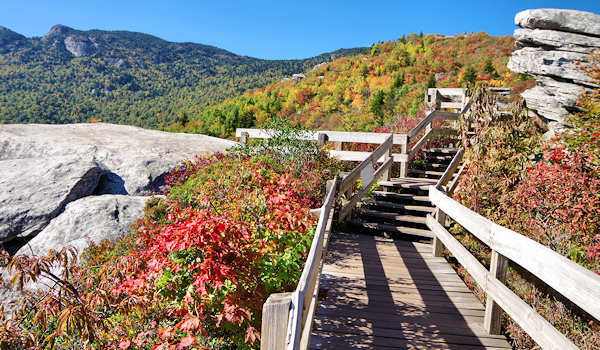 Mid October: The hike to Crabtree Falls along the Blue Ridge Parkway. 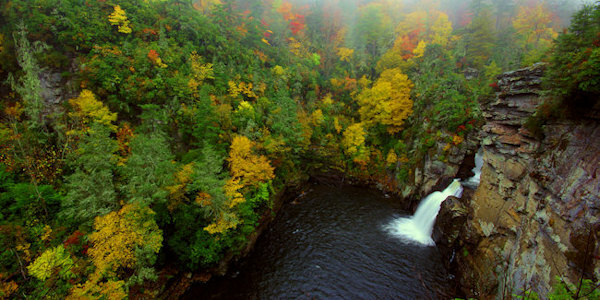 Mid October: Hike to several overlooks at Linville Falls. 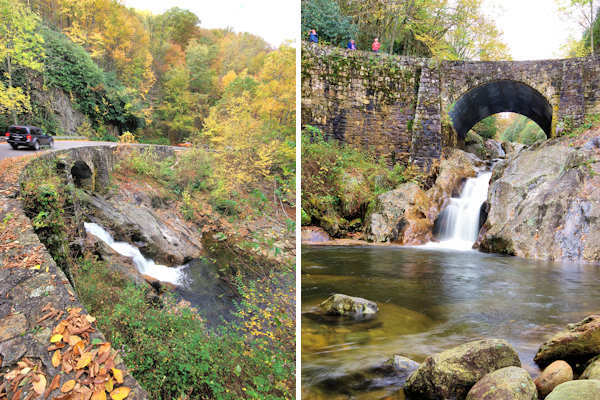 Also see our Top Waterfalls along the Blue Ridge Parkway. 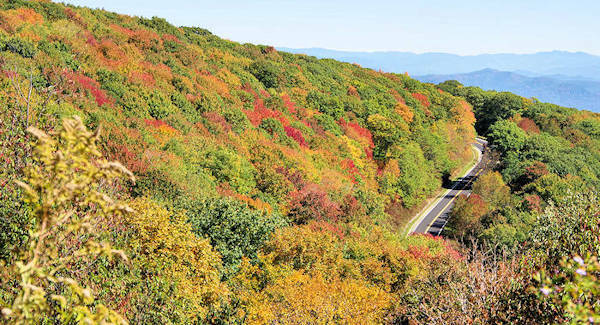 Mid October: Fabulous fall color is showing along the Cherohala Skyway in Graham County. 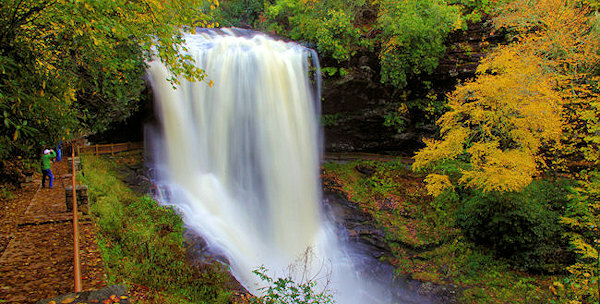 Mid October: Walk behind Dry Falls in Nantahala National Forest. 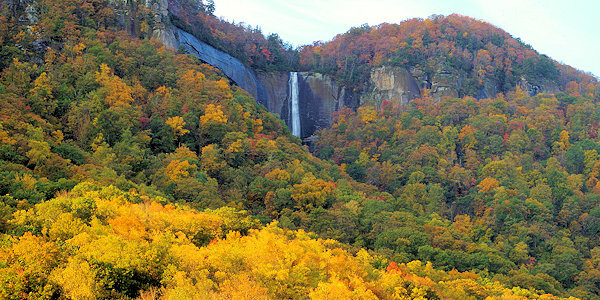 Mid October: Left, Upper Whitewater Falls nears peak color. 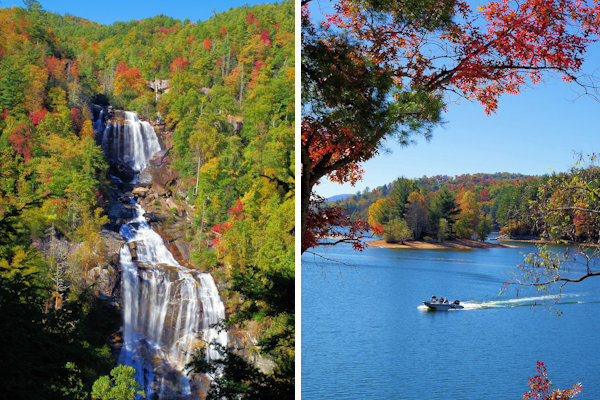 Right: Take a fall boat ride on beautiful Lake Glenville near Cashiers. 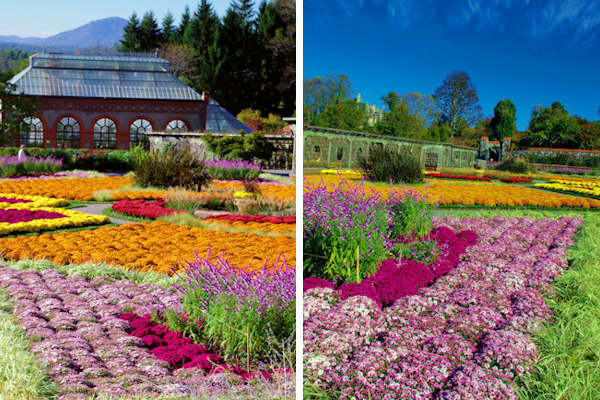 The Walled Garden at Biltmore Estate has colorful mums the entire month of October. 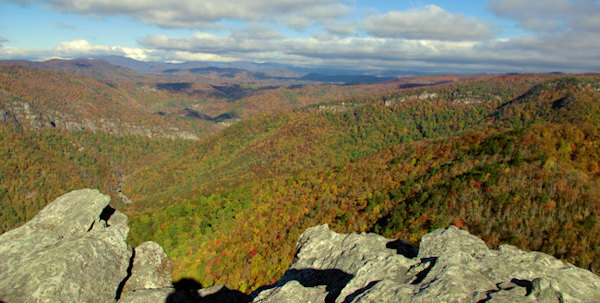 Mid October: The spectacular view from atop Hawksbill Mountain overlooking the Linville Gorge. 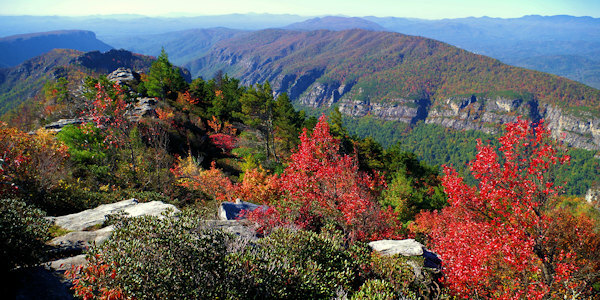 Mid October: Table Rock summit overlooking Linville Gorge. What a hike! 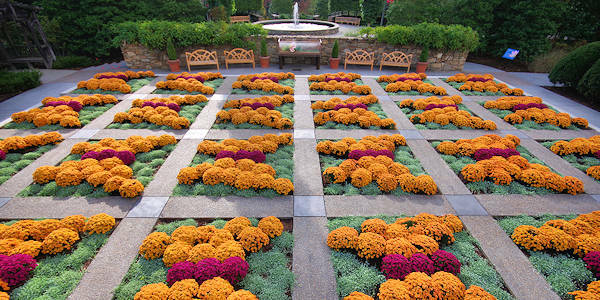 October all month: Mums in the Quilt Garden at the NC Arboretum. 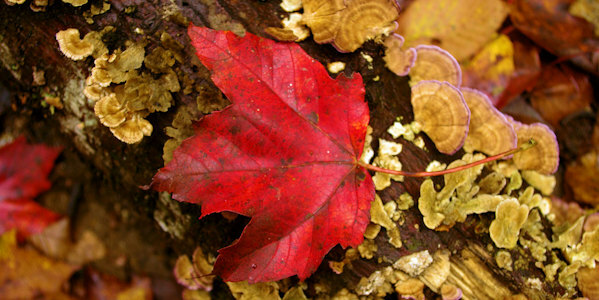 Read about their fall things to do and events. October all month: Picnics with a view. See our Top 20 Picnic Spots. 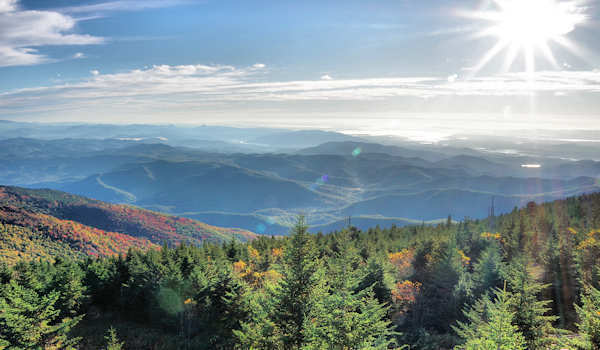 Mid October: Stop at the Sunburst Falls area along the Forest Heritage Scenic Byway (NC Highway 215) in Haywood County. 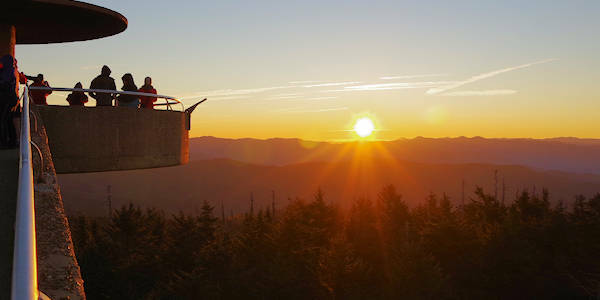 October all month: The sunrise from atop Clingmans Dome in the Great Smoky Mountains. Put this experience on your bucket list! 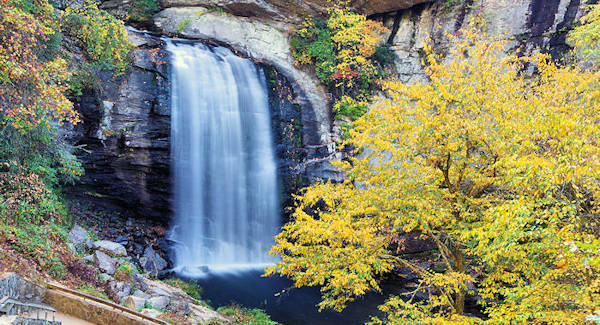 Mid October: Looking Glass Falls in Pisgah National Forest is roadside so all can enjoy. 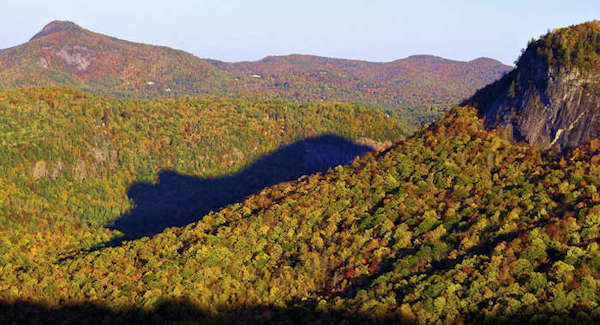 Late October: See the Shadow of the Bear appear each evening near Cashiers. 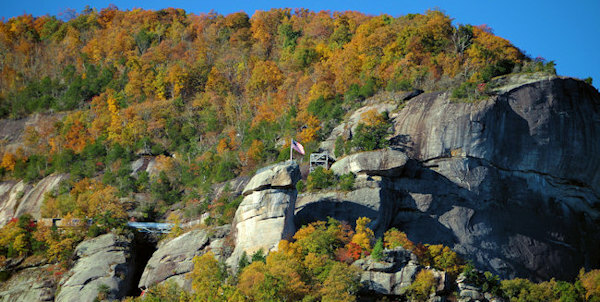 Late October: Chimney Rock with peak color at the top of the ridge on week, with color views of the valley below into early November. 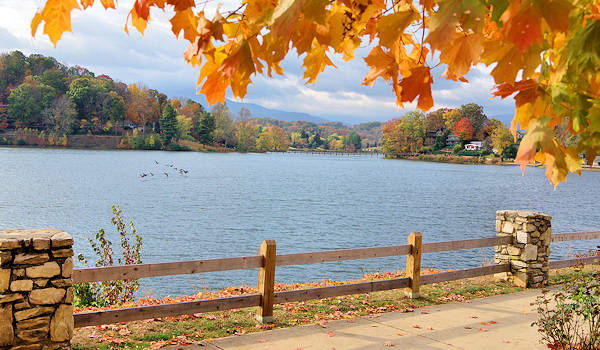 Late October: Peak color at Lake Junaluska - drive or walk the 4-mile loop around the lake. 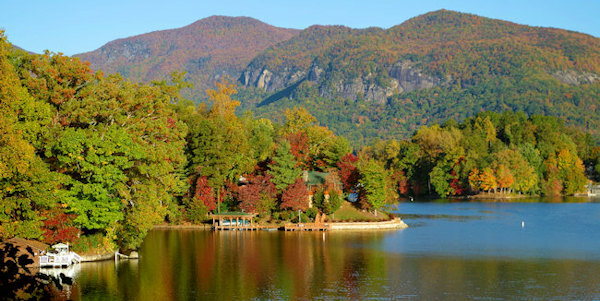 Very Late October: Lake Lure peak color often lasts into early November. 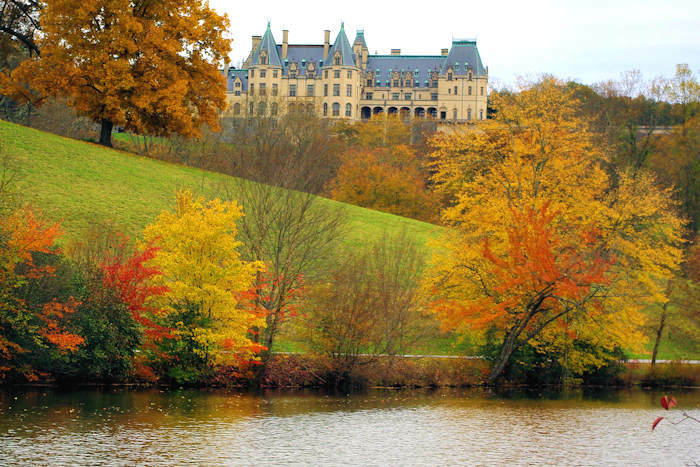 Late October: Biltmore House with fall color throughout the estate. 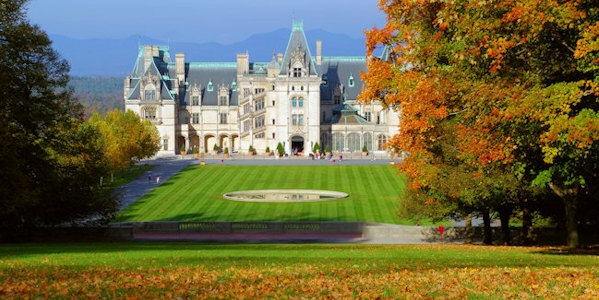 See our Fall at Biltmore Guide. 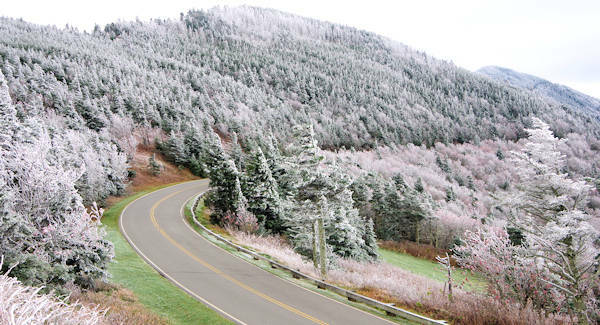 Late October: Occassionally, winter meets fall at Mt Mitchell, covered in rime ice with temps in the 20s. 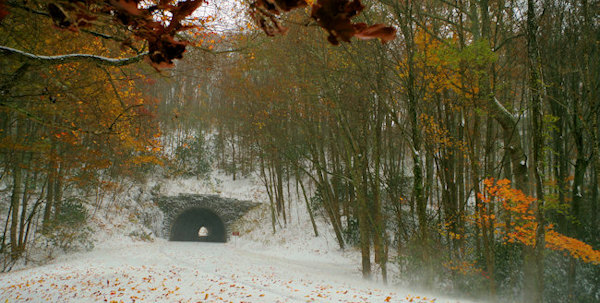 Early November: Blue Ridge Parkway Tunnel with an early snow combined with fall color.